For some of us, books are as important as almost anything else on earth. What a miracle it is that out of these small, rigid squares of paper unfolds world after world after world, worlds that sing to you, comfort and quiet or excite you. Books help us to understand who we are and how we are to behave. They show us what community and friendships mean; they show us how to live and die. 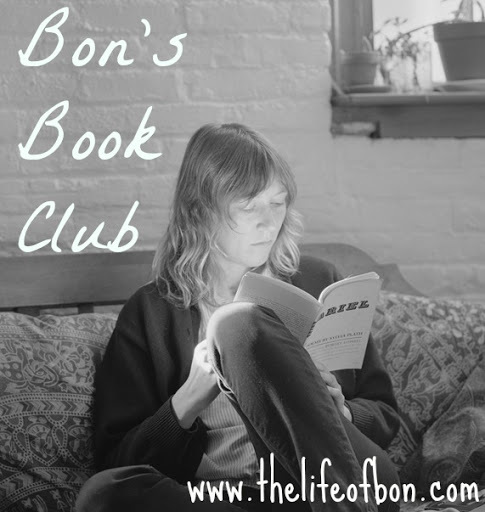 Welcome to May's book club discussion featuring.... Silver Linings Playbook! If you haven't written your review yet and are stuck about what to say, here are some questions to get your brain cranking. You can use the questions or you can not the questions- it's up to you. I mean, I ain't no English teacher! What did you think of Pat, the main character? Did you see him as realistic? Is he a strong enough character to carry the story? Did you feel satisfied with Pat and Tiffany's relationship? Did you want more out of it? Why the heck did Matthew Quick talk so much about Eagles football? I mean- what's the point of that?!? How did you feel about the end... conclusive enough for you? Anything that bothered you or you found distracting about the book? I thought Silver Linings Playbook was just mediocre. To start with, the main character, Pat totally drove me nuts. I get that he had suffered a traumatic breakdown and everything, but the author portrayed him not as depressed and confused, but more like a little child or severely handicapped. I couldn't really grasp on to the love relationship between him and Tiffany because I felt like I was reading about a little kid the whole time. I have heard that the movie doesn't make him appear quite so little kiddish, so maybe I need to watch that. A couple of years ago I read this book narrated by a little boy with autism, The Curious Incident of the Dog in the Nighttime. 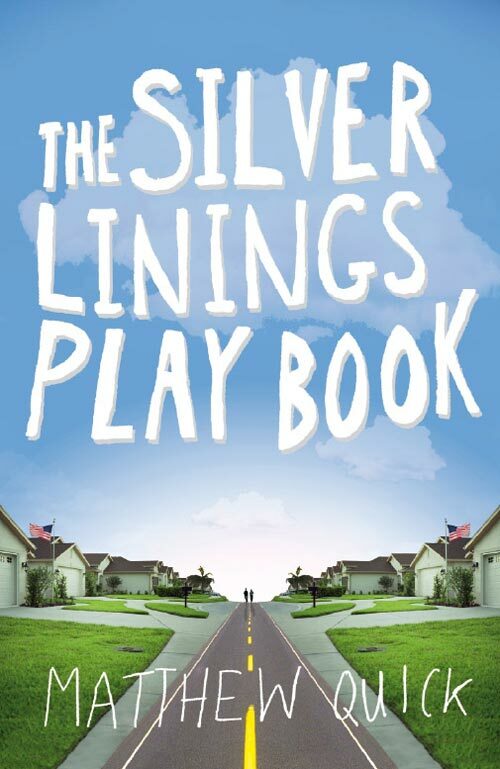 The narrating in Silver Linings reminded me exactly of that book. I wanted to read about an adult who's had some hard times, not an autistic kid. The other thing that was tough for me was that I wanted much more from Tiffany in the book. I felt like she was a total side story, and then at the end of the book the author was like, "No! Actually! I want this relationship to be the main focus of the story!" whereas before it was always just kind of off in the background. The book gives the impression that Matthew Quick had no idea what he wanted Pat and Tiffany's relationship to be or become... so it just felt like it was drifting/ wandering the whole time. And then at the end they just lay down in a field of snow and you better believed I wanted a little more action than that! Lastly, (this is my last complaint, I promise. Then I'll get to the stuff I did like) throughout the entirety of the book Matthew Quick hooked the audience by making it seem like some horrific, tragic event had happened in both Pat and Tiffany's life and that was why they were so jacked up. So I waited and waited the whole book for the big reveal- what is it?!? What most awful thing has jacked up these people's lives so terribly much?!?! And then after all that waiting it felt so anti climatic- Pat caught his wife cheating, Tiffany was a sexaholic. Not that those aren't serious and devastating issues, but it just felt very... cheap?... to me. Very... not creative. Very... "let's see here... what bad thing can I make happen to this guy? Oh! I know! His wife cheated on him!" I guess I felt after waiting the whole book, the tragic event would be a bit more dramatic/ original/ creative. Interestingly enough, I loved the father-son relationship. The dad was one of my favorite characters in the book because I felt like he was a pretty realistic portrayal of so many of the dads out there- wanting to show love, wanting to help his son, but at the same time extremely frustrated and annoyed with a son that doesn't quite meet expectations. I also loved how they all bonded over Eagles football. There were times when I thought Quick overdid the football, but for the most part I loved it as a symbol of the relationship for these men. They can all devote their lives to Eagles football, but can't as easily show their devotion to each other. I felt like Eagles football for these man had to be the physical thing that they use to show each other that they really do care. 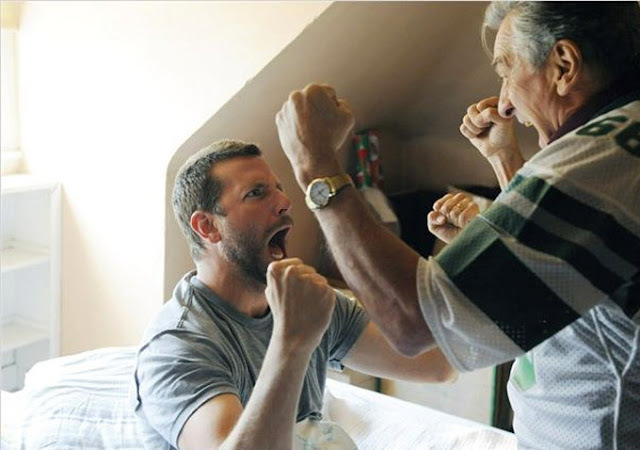 For example, the dad could only bond with Pat when they were watching football. I guess it kind of makes me sappy and teary thinking about how men have to have sports and video games and stuff like that, but all they really want is to bond with each other. Favorite scenes from the book: I LOVED the "montage" of Tiffany and Pat getting ready to perform their dance- I thought it was such a brilliant way for Pat to write about their experience. I liked the idea of taking a movie scene and making it into a book scene instead of vice versa. I also totally loved the first time Tiffany and Pat go out and Pat is so nervous about the bill being too expensive that he just orders raisin bran and then tips the waitress $34. Maybe because I was a waitress for three years, who knows, I just thought that this was about the sweetest scene ever. Alright, now link up your reviews! If you've got a short comment just stick it in the comment section- if you did a review on your own blog make sure to give us a link below for where you did your review. I'm excited to read all about it! I hope those of you who loved the book can convert me! Oh- and if you saw the movie but haven't read the book you can comment too! We don't discriminate around here! June's book club will be held on Thursday, June 27, and we will be discussing Seriously, I'm Kidding by Ellen Degeneres. oh my gosh, how much do you read Bon? I saw you reading the happiness project too. I still haven't written anything about the Great Gatsby. lol. I guess if it's not my book club it's okay to be months behind. Looking forward to next months book, I LOVE Ellen, and to be honest, I didn't even know she had written a book, so I am even more excited to find out about it and dig in. You know, I didn't think of The Curious Incident of the Dog in the Nightime's narration until you mentioned it and I can see what you mean about that. I enjoyed reading your review of this book, but I actually really liked Silver Linings Playbook. I think I liked that you could feel, or at least I did, the desperateness of Pat. His thought process so jumbled and a man really slipping away and I thought it was a heartbreaking and interesting portrayal of mental illness. There were some places where I agree with you and could have done without, but I completely agree with you about the father-son relationship aspect. I thought the author did a very good job with it. I actually saw the movie before reading the book, something I normally try to avoid! I really liked the movie when I saw it. I thought Bradley Cooper did a great job, but then I read the book and the book really is so different. What is different for me about the movie and book is that I actually like them both independently of one another. I think the movie was a good film, but rewatching it after reading the book there was so much left out, so much changed. I think a big change was that father-son relationship. In the movie it seemed like the father was trying more to have a relationship, whereas in the book the father was struggling so much with his own issues and maybe couldn't deal with Pat and his problems. Also there was so little about the brother in the movie and the time span was so different. Sorry, I've written my own novel here. Anyway, I actually liked this pick for your book club! I really liked the book. I agree with you about the scenes--those were two of my favorites as well and I too liked the father/son relationship. I am looking forward to seeing the movie. I absolutely loved this book. I thought the movie was amazing, and I liked that it had deviated from the book in enough ways that reading the book was worth it. I actually liked that Pat's voice seemed almost childlike, but I can see what you're saying about it too. And I do agree about Tiffany - she just wasn't as much a part of the book as I had expected (based on the movie). Basically, what you said. Except I liked it. Not sure what about it I liked... I'll have to think on that some more. I hated how he talked like a child. I assumed the medicines changed him too much. I've heard the movie was amazing and plan on seeing it when it's not $22. I also liked the fault. So for me it's 50/50. Hated gone girl and the great gatsby. But I'm also reading the happiness project and I love it. Thanks for that recommendation! I haven't read the book, I did see the movie and tell me, is the book anything like the movie or is it totally different? I know that I cannot watch a Nicholas Sparks movie then read the book, I have to do it the other way around. I would love to read this if I'm not going to be disappointed or bored persay since I already saw the movie. I liked the book well enough, but, like you, the narrative totally threw me off. I couldn't get into it because it was so child-like and why the heck are we talking like a 5-year-old?? I told my friends who asked that I did enjoy the book, but I think I would enjoy the movie more - and that's the first time I think I've ever said that. Because of the narrative, all of the characters fell flat for me. Pat couldn't seem to empathize with anyone and therefore you really have no idea what anyone else is thinking this whole book. So yeah. I liked the story, I liked that it brought to light many facets of mental illness, but the way it was written just didn't do it for me. Sorry Matthew Quick. I 100% agree. I saw the movie a few weeks ago and LOVE LOVE LOVED it. I even saw it again. SO GOOD. But I had been told that the book wasn't as good as the movie. A rarity, but I found it was true. The book was okay, but I had the same complaints you did. I expected more overall. However - the montage was the best. The only thing the book I feel really did better with was his relationship with his therapist. Unfortunately, I read the book after seeing the movie because I didn't know it was a novel until I saw the movie. Sad for me, as I generally prefer reading the book prior to seeing the movie. I found Pat's narration to be more like childlike innocence than childishness, but I think it's because I saw the movie first. I think I enjoyed the book more than you. I thought the movie was great - Jennifer Lawrence kills in her performance! There's this one scene where Pat's reading "The Sun Also Rises" and gets to the end and chucks the book out of the window because the ending was sad. I myself have felt like throwing a book out the window because the ending sucked. Endings are very important to me. You should see the film - just be warned, there are a LOT of eff-words. Other than that, it's awesome, and if you liked the dad, then you will love Robert DeNiro's portrayal. I loved the movie but have not yet read the book. Based on your review, I think I may pass. The movie was so incredible it moved me to tears and JLAW I think DEFINITELY deserved that Oscar for her role as Tiffany. The love story is the main focus of the movie and the 'Tragedies' of their life are what pulls it all together. They're both "crazy" and the audience knows what happened from the get go. I liked that. Made it easier to bond with each of them. The dad is portrayed as OCD in the film which explains a lot of the Eagles football obsession. I'm interested to know if they explored this theme at all in the book? It sounds like you read a lot. Are you on Goodreads? AND have you ever read anything by Johnathan Safran Foer? He wrote 'Extremely Loud & Incredibly Close' (amazing) and another incredible book called 'Everything is Illuminated'. When you were discussing 'The Curious Incident of the Dog in the Nighttime' it reminded me a lot of his writing and style. If you have not read his work it will change you. "I do not see plays, because I can nap at home for free. And I don't see movies 'cause they're trash, and they got nothin' but naked people in 'em! And I don't read books, 'cause if they're any good, they're gonna make 'em into a miniseries." Just finished The Paris Wife too. I really liked it, but thought it ended way too fast! What happened to Bumby? I needed more closure for Hadley! Do what I did and watch Midnight in Paris now just to tie it all together. I haven't read the book, but I loved the movie! I haven't read the book, but the movie is certainly up there in terms of my favorite movies (Bradley Cooper and Jennifer Lawrence are also two of my favorite actors/actresses) - David Russell, the director of the movie, did it because his son (I believe that's the family member) has problems similar to Pat and so he sculpted the movie and screenplay around the realism of an adult with child-like propensities and he did an amazing job. I think that's part of the reason why people seem to like the movie better than the book as a whole - from the beginning, their problems are out there for the world to see and they are both clearly adults who handle certain events like children. It's fascinating to watch. Usually, I completely agree with almost everything you write, but I've got to say, I really disagree on this one. I took the book on our vacation to St. George last week and breezed right through it in a day and a half (the 6 hour car ride helped). I've always been fascinated with books about mental illness (The Bell Jar was my favorite for a long time), and so that's probably why I loved the narrator--I knew from the set-up at the beginning that he would be unreliable, so I had to question everything he said. (For me, that questioning was fun--I could see why it would drive a lot of people crazy though). I think because he's unreliable and because he's obsessive-compulsive (with some major anxiety issues thrown in), the relationship between him and Tiffany wasn't supposed to be a focus at first (because he himself couldn't focus on it). I loved their little screwed-up relationship, and the ending made total sense since he has issues with touching people. I agree with you totally on the montage--that was my favorite part of the whole book, and I was shrieking with laughter (I even made my husband listen to me as I read parts of it aloud). Overall, this is one of the most original, endearing books I've read in a long time. Granted, I know my obsession with anything psychological gives me a huge bias, but still--I LOVED this book. It may be a Hollywood comedy, but it's one that feels beautifully alive.